I'm supremely untalented in arts and crafts. 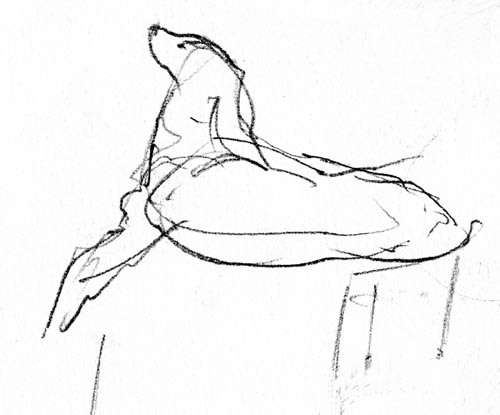 I can't sew a straight line; in life drawing class, my version of a reclining human form looked like a displaced sea lion; my attempts to learn how to knit were so laughably futile I decided I'd have better luck using the knitting needles as chopsticks. My failures in this sphere are probably part of what caused my lack of interest in craftsy mysteries. I'm not bad at cooking and baking, so I perk up more at mysteries that feature food. Not so much the ones with cute, culinary titles and lots of recipes in them, though. I prefer books that integrate a lot of good food in the characters' lives and make me want to dash out to a restaurant or into the kitchen to put the pots and pans to work. Naturally, the French and Italians specialize in making the reader drool all over the page. Georges Simenon's Inspector Maigret regularly eats traditional dishes, like fois gras with truffles, tripe á la Caen, coq au vin, onion soup and crèpes Suzette––and there's more where that came from when he's at home. Madame Maigret is characterized as a good, plain cook, but her meals sound delicious to me––and they attract Maigret home for lunch quite often. There is even a book of her dishes, collected by Robert J. Courtine and titled Madame Maigret's Recipes. The book is out of print, but can be located. Even in a gritty, noir series like Jean-Claude Izzo's Marseilles trilogy, protagonist Fabio Montale takes time out from investigations to enjoy the city's bars, music and, yes, food. Of course, it has a more Mediterranean flair than your Parisian cooking, but that's not a bad thing; not with dishes like spaghetti with basil and garlic, baked anchovy purée, and fricassée with clams. When the moon hits your eye like a big pizza pie, that's not just amoré, it's a regular night in a book featuring Donna Leon's Inspector Brunetti, Andrea Camilleri's Inspector Montalbano or Michael Dibdin's Aurelio Zen. 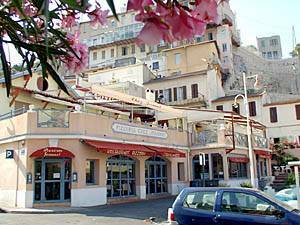 Maybe my favorite meal description is in Camilleri's The Smell of the Night, when Montalbano stops in at a tiny trattoria recommended to him. It doesn't look like much of a place to him, but he's ravenous and decides to give it a try. The proprietor tells him they have burning pirciati that evening if he feels up to it. Montalbano doesn't want to give the man the satisfaction of asking how the dish is prepared, and he certainly feels he's "up to it," whatever that means, so burning pirciati it is. When the dish arrives, it smells wonderful, and Montalbano immediately digs in––only to feel as if his mouth has burst into flames that are only barely subdued by his drowning them in an entire glass of wine. Montalbano decides he must know what is in the dish, and the proprietor tells him: "Olive oil, half an onion, two cloves of garlic, two salted anchovies, a teaspoon of fine capers, black olives, tomatoes, basil, half a pimento, salt, Pecorino cheese, and black pepper." Battling the sweat pouring down his forehead, Montalbano devours the whole dish and grabs bread to mop up the juices, "[p]unctuating his forkfuls with gulps of wine and alternating extreme agony and unbearable pleasure." He refuses a second course, and the now-respectful proprietor is understanding, since he comments that "[t]he problem with burning pirciati is that you don't get your taste buds back until the next day." Closer to home, Rex Stout's Nero Wolfe is at least as famous a gourmand as he is a detective. He keeps a full-time chef, Fritz, at his brownstone, and with Fritz's cooking, there is no wonder the detective weighs, as his colleague Archie Goodwin tells us, one-seventh of a ton. You won't be surprised to learn that The Nero Wolfe Cookbook was published–––and, unlike Madame Maigret's Recipes, this book is still in print. Georgette Spelvin is devoted to Nero Wolfe (and even more to Archie), and I have challenged her to write about the objects of her devotion here. In hopes that she'll be more likely to comply, I won't say any more about Nero Wolfe, Archie or Fritz's cooking. 1. Adjust oven rack to middle position and heat oven to 275 degrees. Pat steaks dry with paper towels. Cut each steak in half vertically to create four 8-ounce steaks. Season steaks liberally with salt and pepper. Using hands, gently shape the steaks into uniform thickness. Place steaks on wire rack set in rimmed baking sheet; transfer baking sheet to oven. Cook until instant-read thermometer inserted horizontally into center of steaks registers 90-95 degrees for rare to medium-rare, 20-25 minutes; or 100-105 degrees for medium, 25-30 minutes. 2. Heat oil in 12-inch heavy-bottomed skillet over high heat until smoking. Place steaks in skillet and sear until well-browned and crusty, 1-1/2 to 2 minutes, lifting once halfway through to redistribute fat underneath each steak. Reduce heat if food begins to burn. Using tongs, turn steaks and cook until well-browned on the other side, 2 to 2-1/2 minutes. Transfer steaks to clean rack and reduce heat under pan to medium. Use tongs to stand two steaks on their sides. Holding steaks together, return to pan and hold them with the tongs so that you can sear all the edges until browned, about 1-1/2 minutes. Repeat with remaining 2 steaks. 3. Return steaks to wire rack and let rest, loosely tented with foil, for about 10 minutes. If desired, make a steak sauce in the now-empty skillet; e.g., red wine and mushroom pan sauce. A couple of weeks ago, I listened to the audiobook of Tarquin Hall's The Case of the Deadly Butter Chicken. The protagonist of Hall's mystery series is Delhi private detective Vish Puri. When I tell you that his nickname is Chubby, you begin to understand that food is something Vish takes very, very seriously. As he zips around Delhi, he makes detours to all his favorite street vendors. In just this one short book, he eats at least a dozen meals that will have you looking up airfares to India, or at least plotting an immediate visit to the nearest good Indian restaurant. Half of these dishes I've never heard of, like poori, rajma chawal, papdi, channa batura and bedmi aloo, but that doesn't mean I wasn't ravenous for them. 1. Make 3 parallel cuts on top of each piece of chicken. Place the chicken in a resealable bag. 2. Combine the lemon juice, red pepper flakes and salt; pour over the chicken. Seal the bag and refrigerate 30 minutes. 3. Combine the yogurt and cream in a bowl; blend well. 4. Mix together the garlic paste, ginger paste, coriander, cumin, garam masala and salt. Add to the yogurt mixture, blending thoroughly. 5. When the chicken has marinated for 30 minutes, remove it from the refrigerator, open the bag and pour in the yogurt mixture. Reseal the bag and refrigerate overnight. 6. 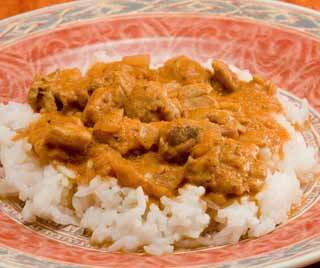 Next day, to make the sauce, combine the ginger, ground red chile, garam masala, mace, nutmeg, white pepper and brown sugar in a small bowl. 7. Melt the butter in a large skillet over medium-high heat. Add the tomatoes, tomato paste, the spice/sugar blend and water. Simmer, stirring frequently, for 20 minutes. 8. Add more water if the mixture gets too dry. 9. Preheat the oven to 450 degrees. 10. Remove the chicken from the marinade; discard the marinade. 11. Arrange the chicken pieces in a baking pan large enough to hold them in a single layer. Bake for 30 minutes. 12. 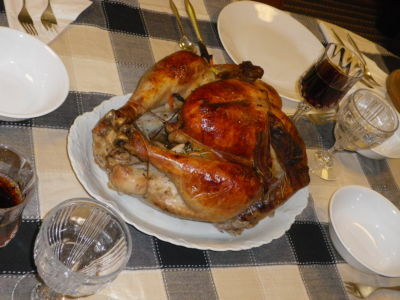 Let the chicken cool until you can handle it; then remove the meat from the bones and discard the bones. 13. Add the chicken meat, the cream and fenugreek to the sauce. Simmer for 10 minutes, stirring frequently to prevent burning. Add salt to taste and serve over rice. Serves four. Nutrition information per serving: 325 calories (not including the rice), 28 grams protein, 8 grams carbohydrates, 20 grams fat (10 grams saturated fat), 1 gram fiber. If you want to read mysteries that won't make you hungry, I would recommend most Nordic mysteries. The food usually sounds dreary at best, dreadful at worst. Sheep's head or fermented shark fin, anyone? If the food isn't frighteningly grotesque, it's just sad, like Stieg Larsson's Lisbeth Salander and her regular diet of frozen pizzas. I always feel so sorry for the Nordic books' characters that I want to make them some Swedish cream wafers; simple cookies so good that I haven't made them in decades because I will eat the entire batch all by myself. I have no idea where I got this recipe. I just have my handwritten index card from at least 30 years ago. Mix together the wafer ingredients and refrigerate the dough for at least an hour, until it is cold. Using one-third of the wafer dough at a time, keeping the rest cold, roll out the dough 1/8 of an inch thick on a lightly floured surface. Cut the dough with 1-1/2 inch round cookie cutter (flour the cutter so it doesn't stick), coat both sides of each wafer with granulated sugar, prick with a fork four times. Bake the wafers for 7-9 minutes, until a light golden. Do not brown. Let cool. While the wafers are baking and cooling, mix the filling ingredients until the filling is smooth. Once the wafers are completely cooled, spread the flat side of a wafer with the filling and lightly press the flat side of another wafer against the filling to make a filled cookie. Repeat with the rest of the wafers and filling. Would you like to tell us some of your recipes and the books that inspire you to make them? Enjoyed this post, Sister Mary. I do love Rex Stout's Nero Wolfe and Archie Goodwin and own the cookbook you mention. In the series book TOO MANY COOKS, Wolfe makes one of his rare excursions from his Manhattan brownstone. He and Archie travel by train to the Kanawha Spa in West Virginia, where a group of international chefs called Les Quinze Maîtres are meeting and cooking a special dinner. Wolfe will speak about the contributions of American cuisine to haute cuisine. He will also solve a murder that wasn't on the menu. Do you have a favorite recipe from TOO MANY COOKS? I looked at the index online and it was mouth-watering. Sister Mary, it's so hot here right now I'm stewing in my own juices. I need some of Nero Wolfe's Pineapple Sherbert, Rex. Preferably accompanied by small macaroons. Oh, Sister, everything looks so delicious! I have to try the Swedish Cream Wafers. Apparently what they lack in food that's appealing they make up in sweets. The food described in Nordic books is sometimes more vile than the crimes. Susie, I totally agree. Those Nordics have served us some good crime books and great sweets. Making Spritz cookies is always on my Christmas calendar. Your recipes and books you mention are irresistible, Sister. I'm going to make that pasta for dinner and read that Camilleri for dessert. Susie, those Swedish Cream Wafers are too good, especially for a butter fiend like me. Della, you'll have to let us know if smoke comes out of your nostrils if you make burning pirciati!